I’ve been booking travel for 42 years. I’m a Master Cruise Consultant with CLIA, and have been on over 70 cruises myself. Primarily I work with cruisers to the Caribbean, Alaska, and Europe – although I can coordinate itineraries anywhere. What I want to achieve for travelers is pretty simple: I hope to deliver dreams, help clients cross items off their proverbial bucket list, and at core, I want you to come back happy. If you’d be interested in working together, definitely reach out. I love customizing your history and travel preferences into the perfect experience for your family. 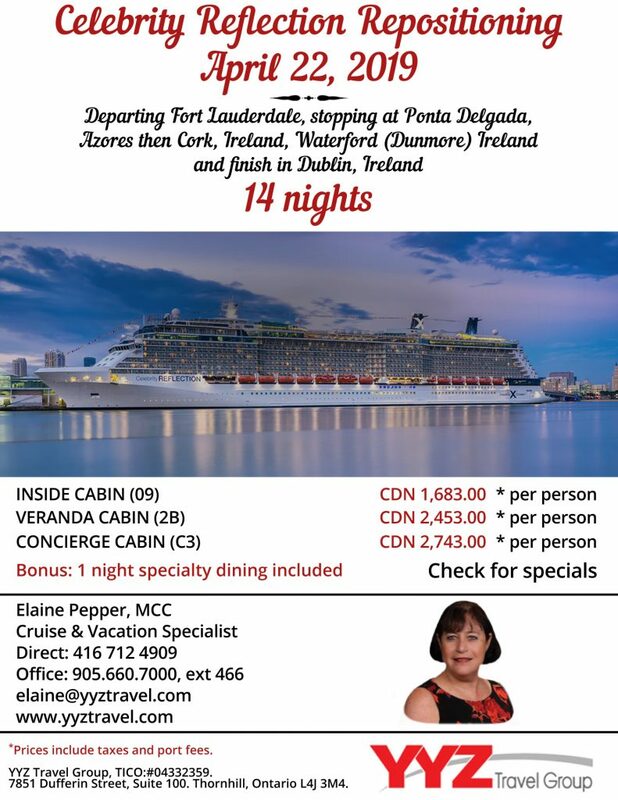 Book Your Cruise Trip with Elaine! Elaine is a fantastic travel advisor. She is knowledgeable, practical, and helped us think through some of the details that we hadn’t considered. Our trip was flawless end to end including additional insurance we needed. I highly recommend working with Elaine! Elaine handled every aspect of our trip like the professional she is. With her wealth of knowledge she provided us with very good advice since we’ve had no recent cruising experience. It’s very important to us that our travel advisor respond to our questions in a timely manner. Elaine exceeded our expectations in that regard, and was unfailingly pleasant and cheerful. She’s a joy to work with and we recommend her highly. Elaine was easy to talk to and she was very helpful in making all our arrangements pre and post cruise. She worked hard as there were three of us traveling, each from a different city and one from a different province. She was able to answer our many questions. I booked with Elaine for the first time a couple of months ago and could not be more pleased with how helpful and professional she was. She booked a cruise, flights and hotel rooms very quickly and saved me money by finding such good deals. Elaine was knowledgeable about the cruise line the ports we would visits and she provided many helpful tips. She was always available to answer questions and at appropriate times, reached out to ensure we had completed required tasks and to see if we needed any support. We will definitely call Elaine when we plan our next vacation. Elaine found us the vacation we wanted, at the price we could afford, Elaine put together a great package for us , she was extremely knowledgeable, and really understood our needs, and wants, thank you Elaine Pepper for all that you do, and making our vacation Truly rememberable. As always Elaine did a great job and consequently our vacation was wonderful!! Elaine was most helpful as we were a party of 8, with 4 children. She did a wonderful job sitting us all together and answering any questions we had. I had a few questions for her before we left and within an hour or so she had given me the answers. I would totally recommend Elaine’s services to all people I know. Elaine made miracles happen! My family of 8 booked a couple months ahead and I wasn’t sure I could get the time off from work. End result was I was approved for time off and booked 5 days before leaving. The flight was full and never being on a flight before I really wanted to be with my family. Elaine made this happen and it turned out to be the most fantastic vacation for all of us. To be together on the plane and close rooms on the resort. She is such an professional while dealing with her and I will certainly use her services again. Thank You Elaine for arranging the most wonderful family trip and we will all have so many memories from it. The hotel was beautiful with warm weather and sun for most of the vacation. The only problems were with construction of new rooms going up and the maids not cleaning the room before 2 every day even when reception is advised that the customer wants the room cleaned before noon. The staff was friendly but the cleaning staff spoke no English and as we were told we should learn Spanish. The grounds were nicely kept and during our stay they put up the Christmas decorations giving it a more festive feel. The room was comfortable with a queen size bed and a large shower stall. The food was varied and one day they had Peking Duck and the next day lobster. We always ate at the buffet so we got to pick a large variety of food. They always had something Caribbean on the buffet for the more adventurous types. We never went hungry. There was also a small snack bar opened for most of the day for sandwiches, desserts or snacks. All in all it was a great vacation. We have booked with Elaine several times now. She is “on the ball” and on top of things. We appreciate how she is available anytime we email or phone her. Having a travel agent that works 7 days a week is unusual and very much appreciated. Makes us feel very special. We had a wonderful trip-no glitches. Elaine provided flawless arrangements so at everything went smoothly. She reminded us our visas need time to complete and she was so so right. Simply a pleasure to work with! My wife and I have booked several trips with Elaine Pepper, and she never lets us down, She is our #1 travel expert! We have booked several cruises with Elaine. She is on top of everything and keeps us totally up to date. She responds to any questions or concerns very quickly. Other TA’s we have used in the past we have some times had to wait days before they answered us which, in my opinion, makes me feel we are not a valued client. With Elaine we feel valued and is one of the many reasons we continue booking with her. I would highly recommend Elaine. Wish we had found her earlier! We both enjoyed our ports of call, but there were somethings we we disappointed in such as the food in the main dining room. A lot of the meats were dry and some were quite tough. We were expecting more food to be from the area we were travelling in, but it wasn’t anything different than what we would get in the Caribbean. The orchestra for the performances were so loud, you couldn’t really hear the performers, so after one musical, we didn’t go back if it was a musical production. The staff was very friendly and our cabin steward and assistant were amazing. The food in the specialty restaurants was incredible. And the staff there exceptional as well. As always Elaine answered all our questions about the trip VERY quickly. We had a wonderful vacation. Elaine is wonderful, works to assist you with the best upgrades. She is wonderful! Elaine provided prompt and professional service. She answered all of our questions and sought out any information she did not have immediately at hand. Elaine was very responsive to our requests and understood what we wanted from our vacation. She also followed up with us to welcome us home. Elaine Pepper took personal interest, and really understood our requirements, Got us a great price, and made the whole process super easy, Just referred Elaine to my sister in law, and you guessed it, another satisfied customer. Thanks Elaine! Elaine not only recommended one of the best cruises for us, my wife and I, but she also helped us prepare for the trip and provided us numerous recommendations on both things to do and suggested actives during the trip. She understands well our expectation and what we want from our vacation. Her excellent follow-up and guidance made our cruise very easy and enjoyable. She is probably the best agent that I worked with in cruise and other overseas travel planning. I would certainly recommend Elaine to all my friends help them to plan their vacations and cruises. Loved half moon! What a beautiful resort. Elaine planned the most amazing trip for us. Thank you so much! As always Elaine did a great job. She is very efficient and helpful. We only use her now to book our vacations. Always a pleasure helping you and Mark plan your getaways. When you work so hard and need that down time, there is nothing like a wonderful holiday! Cannot wait to help you again!